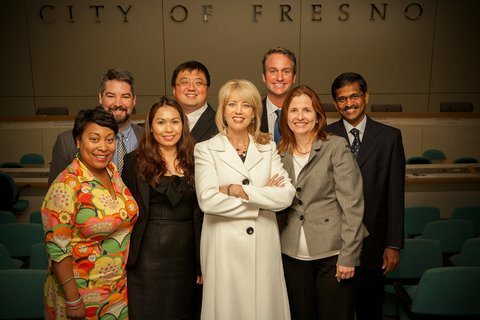 On a warm Sunday in April, seven international IBM team members descended upon Fresno to take part in the IBM Smarter Cities Challenge. Through this program, the team members spend 3 weeks fully immersed in a city in order to find solutions to a problem presented to them by the city. In Fresno, the problem is: How do we mitigate obstacles and enhance assets to revitalize downtown? The team said that Fresno has done a great job putting together long-range plans. And while they are good plans, the city has no sense of urgency. We need a series of quick wins to help build momentum on our way to realizing our long-term goals. CitiStat has the potential to create greater efficiencies and cost savings in Fresno by employing data-driven management systems to monitor and improve the performance of city agencies to produce clearly specified results. While every city has plenty of naysayers, Fresnans have a unique brand of negativity about their city. The team from IBM agrees that this negativity is a deeply ingrained mindset rather than a true reflection on the city. A rebranding campaign can build momentum, restore trust and attract and retain young talent. After assessing Fresno’s broadband situation, IBM determined that we have plenty of capacity for broadband and we need to work quickly to ensure that the current and future generations of workers and students are digitally literate to help Fresno stay competitive in the global economy. Centrally-located Fresno is the largest city in the San Joaquin Valley, which is home to over 350 different varieties of crops. The San Joaquin Valley is some of the most fertile farmland in the world and is adjacent to Silicon Valley, home to America’s high-tech innovation and development sector. It is only fitting that Agriculture and Technology intersect in Fresno. The team’s assessment is that the city is in the unique position to play matchmaker between farmers and inventors and can be the ideal location for Ag Tech companies and startups to locate. IBM’s Team Fresno left us with short-term and long-term plans that answered the question of how to mitigate obstacles and enhance assets to revitalize downtown Fresno. The Smarter Cities Challenge was a success and now it’s up to us to work together to put these recommendations into practice. It’s an exciting time to be in Fresno! I just stepped off of the tallest building in Fresno and lived to blog about it. I’ve worked on setting up computer literacy projects in Africa, and now I’m going to start one here in Fresno for the inner city. I didn’t grow up in Fresno, so I was pretty surprised to learn that such a project would even be needed here, after all, this is the first world, right? I think Fresno is a cool city, and I hope I can help it grow. Thanks to people like you who take the initiative to help out, Fresno is going to grow into the great city it’s destined to be! Keep us updated with the progress of your project, that’s really awesome.